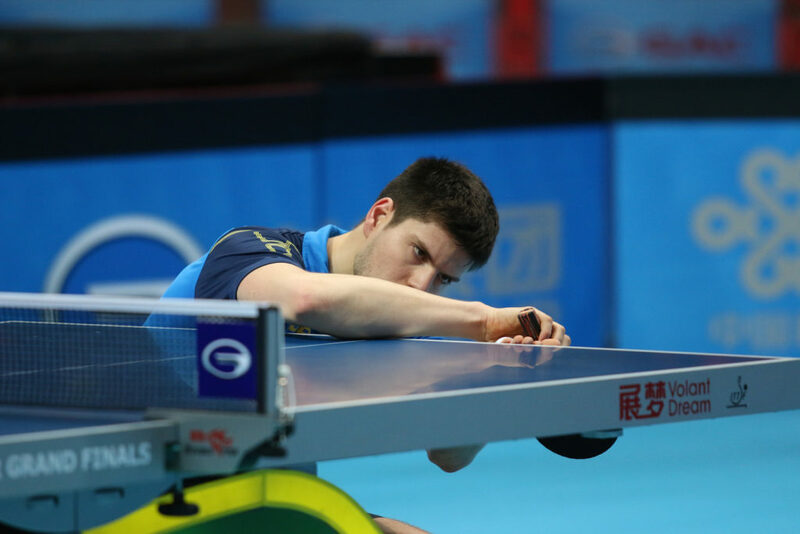 In 2008, The Time Magazine voted Dimitrij Ovtcharov's backhand serve as one of the 50 best inventions by humans, naming it "The New Ping-Pong Serve". Nine years hence, this new Ping-Pong serve still remains as innovative, as threatening and as strong a weapon as it was in 2008. Dimitrij Ovtcharov positioned to make the backhand serve. He places the ball carefully on his palm, wide open. Staring at the ball with an eye of the tiger, he crouches down the table, pauses for a tenth of a second, leaving the opponent bewildered. Then, he slowly rises like a beast, tosses the ball high enough and slices it effortlessly imparting so much side spin along with under spin in the ball, that the audience can see the exact curved path the ball makes and the opponent is certainly perplexed. Dimitrij Ovtcharov’s backhand serve, or “The New Ping-Pong Serve” was one of the 50 Best Inventions of 2008 according to the Time Magazine; the list also included other inventions such The Tesla Roadster, The World’s Fastest Computer built by IBM, The Mobile Robot, Google’s Floating Data Center and the Internet of Things to name a few. His opponents were not surprised. His fans were certainly not. “I practise my serve every day at least 45 min.”- Dimitrij Ovtcharov. And when in tournaments, he is always seen with a bag of balls to practice his serves as part of his warm up before matches, justifying its importance. Ovtcharov’s not only backhand serve but also other ones are equally strong. “I believe that all my three serves backhand, forehand and tomohawk have great quality. Against different opponents and playing styles different serves work better,” he explained. The structure of his game is formed in a way that his serve strategically supports his powerful backhand. “The point with Dima is that the service suits him because his strength is his backhand, so serving with the backhand from the middle of the table or from the forehand enables him to play his backhand early in the rally,” says Ian Marshall, ITTF Publications Editor. To become a player of that stature, you need to have something special, something that is exclusive to you, which defines you. For Ovtcharov, its his serve. Does his innovative technique scare away the opponents? Partly, yes. “I can’t say. But hope so ;),” he said as she smirked away. However, repeating it too often is also not a good idea. You don’t want the opponent to get used to it. Each time you serve, it should be as threatening as before. For example, Ding Ning reduced the number of times she did the squat reverse tomohawk serve in her game after losing to Feng Tianwei in the finals of the 2010 World Team Championships. This was the advice of Zhi Zhihao, national coach. This slight change in strategy helped her improve further, in 2011 she became the World Champion! Dima has been one of the top table tennis players in the world since more than a decade now and thus, being innovative with his serve has certainly been one of the biggest challenges for him. “Actually it got harder with the time to keep the quality of the serve. Since I have to go down so much it’s tough for the body. But I always try to keep and improve the quality,” says Ovtcharov. So will we see some new additions in his serve in the future? “I actually already have new serve technics but it takes a long time to use and continue well after the serve.”- Dimitrij Ovtcharov. Ovtcharov is strategic. He knows when to unleash his weapons. A good serve is useless if it is not supported by a powerful attack. The training is on, maybe we will see some surprises in the forthcoming World Table Tennis Championships in Dusseldorf? Maybe, the world will witness a new invention soon? Ovtcharov crouches so low to make the serve.